November 19, 2018 – Oreste wants to be known as a humble person, who really cares for other people! He anticipates that this semester will be challenging as he adjusts to a new campus. July 7, 2018 – Oreste’s biggest challenge he overcame this last school year was group projects. This year his teacher structured group project differently than he was used to. After meeting with his group and finding roles for everyone, his role was as secretary, they were able to work well together and accomplish their projects! This summer, he is looking forward to spending time with his family and participating in different activities at home. He is also hoping to find a part time job, as well as volunteer opportunities to give back to his community! May 12, 2018 – Oreste values people and being true to who he is, because it is through people’s help and influence that he is who he is today! March 25, 2018 – When Oreste was younger, he wanted to be a soldier because he lived behind a military camp and would attend some of the activities they put on! In five years, he hopes to be experienced enough in his career to run his own business! Feb 27, 2018 – Someone who is very inspirational for Oreste is the founder of Agahozo Shalom Village, Anne Heyman, because she is hardworking and inspires him to never give up! Jan 25, 2018 – Oreste recently read, Becoming Your Best. It helped him to realize that being true to your character means that your actions should reflect your beliefs! Dec 18, 2017 – Oreste explains that since most Rwandans are Christians they usually go to church on Christmas and they wear new clothes. After church families gather together to share a meal together with meat and potatoes. The words Oreste thinks his friends would describe him as is “persistent” because he never gives up easily. Nov 11, 2017 – This holiday season Oreste is thankful for the Lord’s protection towards his mother! He is also thankful for the support of These Numbers Have Faces to attend university. Oreste mostly enjoys Christmas with his family together. Oct 8, 2017 – Oreste spent his summer at home with his mom, sister and younger brothers. He is so excited to see his friends at school again. May 25, 2017 – Something Oreste wishes more people knew about Rwanda is that their history is far more than the 1994 Genocide. March 28, 2017 – When asked about the 3 things he values most, Oreste said caring for others, working hard and being true to himself! Feb 13, 2017 – Oreste feels empowered when he sees how his character influences others in a positive way. This helps him see that he can be the leader his community needs! Jan 17, 2017 – Life isn’t without challenges. Last year, a challenge Oreste faced was transitioning to life at University. With everything being new, Oreste learned how to adapt and be proactive in order to succeed. Dec 8, 2016 – Oreste has a good first term at school, and as 2017 approaches his plans are to start a study group with his classmates so that he and his fellow students can improve in their courses! Oct 14, 2016 – It was a busy summer for Oreste helping build irrigation systems. Oreste worked as a supervisor where he learned about managing big groups of people. 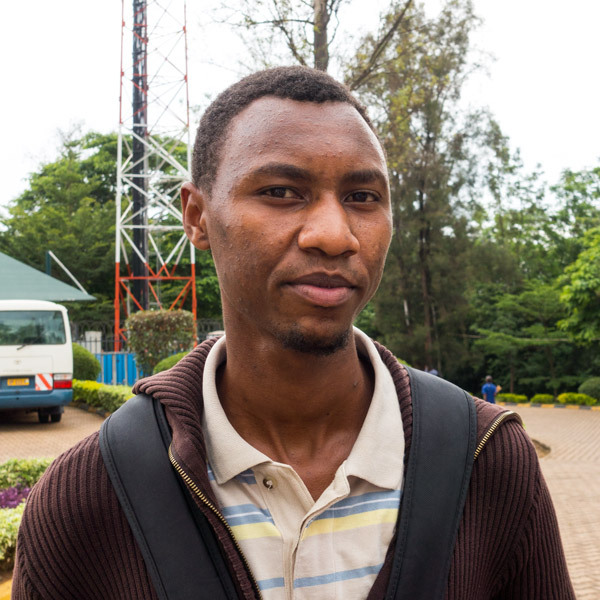 Oreste grew up in a village in Rwanda’s Eastern Province, living with his mother, sister and aunt. In the 1994 Genocide, Oreste lost his father, and his mother and sister were both left with injuries as a consequence of the violence. The most able of his family to work, Oreste has always had many responsibilities and been highly motivated to succeed to better take care of his family. However, as his mother’s health worsened, Oreste felt he shouldn’t pursue higher education so he could stay at home to help his ailing mother. Noticing her son’s loss of hope, one day Oreste’s mother asked him why he was no longer passionate about school. She went on to encourage him, telling him that he would be able to take better care of not only himself, but his family and his community if he had a degree. With that, Oreste’s hope returned. He poured himself into his studies and today he is studying Finance at the National University of Rwanda, with the hopes of one day running his own business!